In the digital dictation and transcription world there is still, in 2013, quite a big divide between the functionality and features of digital voice software for Mac when compared to Windows. 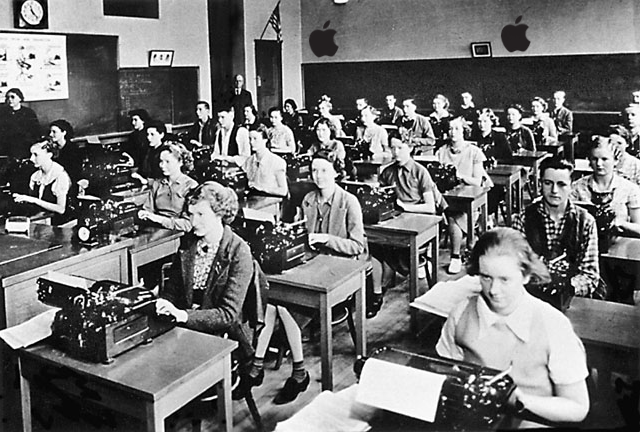 Windows users enjoy a raft of features and functions that are yet to appear in the Mac software. Olympus have led the digital dictation world by being Mac compatible for years, others are now starting to follow. Olympus need to be careful, their DSS Player Plus software is starting to look a little jaded and is in desperate need of an update, even if just a modernisation of the user interface. The younger upstarts are coming! Olympus’ Mac software offering which is called DSS Player Plus v7 does what you need it to do; download audio files from your digital dictaphone, playback dictation on your Mac and plug in a USB foot control for transcription of your digital audio files. Both the dictation and transcription functionality are combined into the one program for Mac users. Whereas on Windows, Olympus have split these into two seperate software packages called the dictation module (which ships with the Pro digital dictaphones DS-3500/DS-7000) and the transcription module (which ships with the AS-7000 transcription kit). How to obtain Olympus DSS Player Plus software for Mac The software is supplied with all the Olympus digital dictaphones, the current range being the entry level Olympus DS-2500, mid range Olympus DS-3500 and top of the line Olympus DS-7000. Olympus AS-2400 contains a RS-28 three pedal USB foot control. Olympus AS-7000 contains a new four pedal RS-31 USB foot control. Olympus AS-2400 contains an E-102 transcription headset. AS-7000 contains an E62 transcription headset. If you would like to use DSS Player Plus for Mac on more than one Mac then officially you will have to purchase an additional licence key. With DSS Player Plus for Mac Olympus use a single install licence model, every install requires it’s own unique licence key. Olympus’ Windows software comes as a single user licence by default but you also have the option to convert these to a MUL (multi-user licence), no MUL is available for Mac. Should you require an additional licence key, because DSS Player Plus for Mac combines both dictation and transcription functions into the one program, you can either buy as AS-7001 (ODMS Dictation Module CD) or an AS-7002 (ODMS Transcription Module CD) both of which come with a single install Windows ODMS licence and a single install Mac DSS Player Plus licence. The AS-7001 Olympus product is significantly cheaper than AS-7002 so Mac users save yourself some money and buy AS-7001 should you need an additional DSS Player Plus for Mac licence key. A common question we are often asked is “Is my digital voice recorder compatible with the Olympus dictation and transcription software for Mac?“. The answer to this if your digital voice recorder is Olympus is obviously yes. But it is not all about the recorder, the key thing to remember is the software is used with audio files so the key question to really ask is “Is the audio format my recorder creates compatible with the Olympus dictation and transcription software for Mac?“. * These formats require a plugin to playback Windows based audio file formats which is built into DSS Player Plus. If you have issues with audio playback of .wma and .wav files then Windows Media Components are available from here. If you are looking for an iPhone app for voice recording make sure it records in one of the above audio formats. .m4a files can be renamed to .mp3 and can then be loaded into the DSS Player Plus for Mac software. 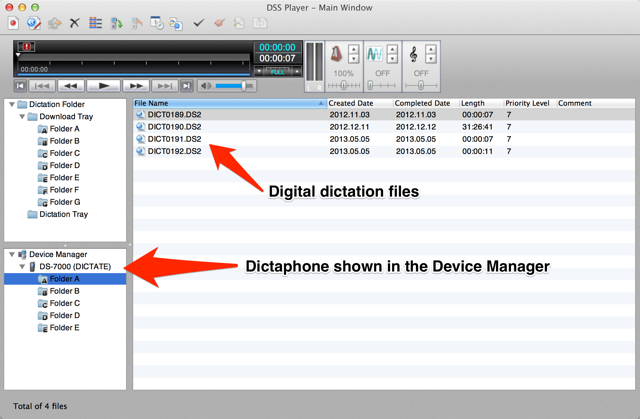 USB connect your digital dictaphone and it appears in the Device Manager tab, its recording folders will be shown and you will have access to play back your dictation on your Mac. DSS Player Plus for Mac can be configured to auto download the audio from the dictaphone to any of the folders in the Download Tray. The Download Tray folders can be configured to be a local folder on your Mac (default) or for streamlined dictation/transcription workflow a shared network or cloud drive for easy access by your typist. A common option is to configure the folders in the Download Tray to link to a Dropbox folder to auto share your dictation with your transcription typist, typing pool or outsourced transcription service. This method automates the send of dictation but audio files can just as easily be dragged and dropped into an email and sent for transcription. Transcription typists will typically transcribe audio placed in the Download Tray folders. As mentioned above Dropbox is a great way to auto-share recorded audio but conversely if audio is received by email it can be dragged and dropped into the Download Tray folders or saved directly to the corresponding folders in your Mac. 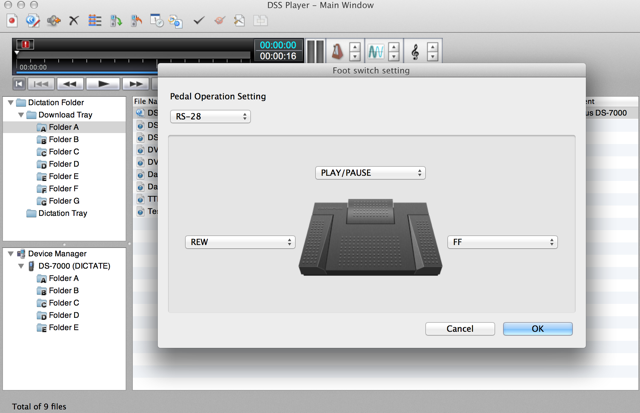 The RS-27 (not available in Australia), RS-28 and RS-31 USB transcription foot pedals can be configured via DSS Player Plus for Mac. Any pedal can be set as PLAY/PAUSE, REWIND and FAST FORWARD to suit your preferred pedal configuration. Additional settings for the pedals include DISABLE, INDEX, COMMENT, EOF/BOF (end-of-file, beginning-of-file), Speed Control and Noise Control. Auto rewind can also be set ranging from 0 seconds (smooth rewind) upto 5 seconds allowing you to better control the rewind of audio when the REWIND pedal is tapped. All audio can be controlled in the background, meaning that you do not need to switch windows from your typed document to the playback controls. You stay in your word processing document and control audio playback using the USB foot control (or hot keys) while listening to the audio. Looking for Windows 10, Windows Server and Citrix compatible transcription software? Click here for details on the licensing models available to Windows small/medium and enterprise Windows ODMS users. If you have more questions on the Mac software for dictation and transcription from Olympus please leave a comment. I have an older pc and mac. do I need to buy two 2400’s and what happens in a few months when I upgrade the laptops? The Olympus software is transferable between computers, so when you upgrade simply uninstall the software off the old computer before installing on the new computer. You must make sure that you keep a note of your licence key/serial number for the software that comes with your equipment. All Olympus Pro recorders and transcription kits come with a single install licence. As long as the software is installed and executed on only one computer for each licence key you are compliant with the software licensing agreement. I have a iPhone and want to dictate on the road. can I send it back by email for the transcription to the office? I also have two older Sony IC reorders will they work? I have ordered an Olympus 2400, not here yet. Will I need a Olympus recorder? I have a habit of leaving surf when traveling. What edge will I get by getting a low price Olympus reorder over the above? Yes, if you have an iPhone you can use the Olympus Dictation App to record and email audio, you will need to buy a one year subscription to the ODDS service. Yes your Sony recorders will work with the AS-2400 on Mac. It is the recording format that is key, not the recorder. If they record in mp3 you are good to go. No, you have ordered the AS-2400 you don’t need an Olympus recorder. Just a recorder that records audio in a compatible format. I have a MacBook with Windows for Mac and have just got an Olympus AS-2400. I have WVA audio files recorded on an Olympus digital recorder but cannot play them on the transcriber (though they are accessible on VLA). I am being asked to download Windows Media Components for QuickTime. I need a free download and QuickTime seems to be no longer free. Any suggestions? Yes for WMA playback on a Mac you have traditionally needed a plugin for this. This is usually Flip4Mac, I have just had a look and this looks like it is a paid component now, it used to be free. By installing the Flip4Mac plugin should let you playback your WMA files in DSS Player Plus. Best option, set your recorder to record in mp3 rather than WMA format, especially for Mac playback. I am a freelance writing and I’m looking for a transcription kit to use for interviews. I’ve been using an Olympus DM-420 voice recorder. Do I need another recorder, and which transcription kit? My computer is a mid-2015 Macbook Pro. Thanks for dropping by and for leaving your question. The Olympus transcription software for Mac works on the most recent OS X versions including the latest El Capitan (10.11). As for kits you have a couple of options, the Olympus AS-7000 Pro Transcription Kit or the Olympus AS-2400 standard transcription kit. AS-7000 has the latest RS-31 USB foot transcription pedal. AS-2400 has the RS-28 USB transcription foot control. The other key difference for Mac users is the software. The Olympus transcription software for Mac called DSS Player Plus v7 is the same in both kits, there is however a key difference in the software for Windows users. For Windows the Olympus AS-7000 containing the Pro Windows transcription software from Olympus called ODMS, the AS-2400 has the Olympus Standard Windows software. So if you are only going to use Mac only then the Olympus AS-2400 transcription kit is the best option or you can buy our Mac specific bundle for transcription. Hi there. I have DSS Player 7.5.2 and and RS28H foot pedal (working on a MacBook Pro OS 10.11.3) But I can’t for the life of me get the foot pedal to talk to the DSS software. It only wants to open and operate iTunes. I’ve followed every instruction I can find. I’m wondering if my MacBook Pro is too old (the processor is 2.26 GHz Intel Core 2 Duo) … any advice would be sooo welcome. Thanks. No your Mac should be fine. When you open DSS Player for Mac go to Device -> Foot switch setting .. then make sure that RS-28 is selected.